Do you have Used or Excess Cisco Router Interface Cards you no longer need and want to sell? NetEquity.com is a leading buyer of Cisco interface modules including VWIC3, PVDM, HWIC, NIM and other router module types. We are always looking for inventory, New, Used and Refurbished. If you have recently upgraded your routing network, or have excess inventory of Cisco Router Modules you want to sell, connect with a buyer agent today to receive a quote! Cisco Router Interface Cards add pluggable interface and functionality to Cisco routers and are available in a wide range of specific types including Application Modules, VPN and Security Modules, Ethernet Switch Modules, Ethernet Routed-Port Modules, Wireless LAN and WAN Modules, ATM, Sync/Async and Analog Dialup and Remote Access. Cisco Router Modules are also available for application specific services such as Digital Modem, Broadband, Serial WAN Interface, Channelized T1/E1 and ISDN Primary Rate Interface (PRI) and ISDN Basic Rate Interface (BRI). 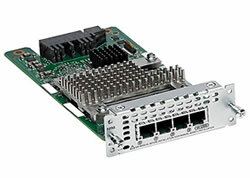 Other module types for Cisco Routers include Voice Modules, Cisco Unified SIP Proxy Modules, Analog and Digital Voice/Fax Modules, T1, E1, and G.703 Multiflex Trunk Voice and WAN Interface Cards, Voice Interface Cards, Cisco Unity Voicemail Modules, Packet Voice Digital Signal Processor Modules, Packet Voice and Video Signal Processor Modules, Packet Voice Digital Signal Processor Modules, USB Flash Storage Modules and Small Form-Factor Pluggable Expansion Module. NetEquity.com Buys and Sells Cisco Router Module Products . If you are looking at Buying or Selling Cisco modules, we can help! Contact us today for a quote. Are you looking for a quote to Buy New or Refurbished Cisco Router Interface Modules? NetEquity.com stocks a huge variety of Cisco interface cards with competitive pricing discounts on both New and Refurbished products, including the popular VWIC3-2MFT-T1/E1 and HWIC-4ESW. To request a price quote, simply contact us or complete a quote request form online to get started. NetEquity Refurbished Cisco Router Interface Cards are professionally remanufactured to Excellent Cosmetic Condition, bench tested by Certified Engineers and are ready to install out of the box. In addition to offering extremely competitive pricing on Refurbished Cisco Router Interface Cards and Modules, we also offer a full 1-Year replacement warranty for End Users on all Refurbished Cisco products. We also maintain a very large standing inventory of the most popular Cisco Interface models and accessories, ensuring that we have what you need IN STOCK, with no long lead times. NetEquity.com wants to buy your used, excess or end-of-life Cisco Router Interface Modules. If you've simply outgrown your Cisco Router modules and are interested in a trade-in or upgrade, we can help. Contact us today to sell, consign or trade your unwanted Cisco Router interface Modules.